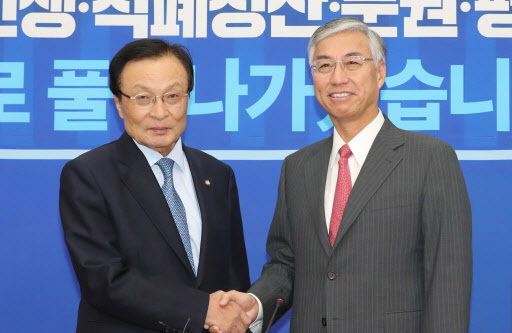 Chinese Ambassador to Seoul Qiu Guohong said Friday that the two countries have fully restored trust in their relationship following President Moon Jae-in's state visit to Beijing last year. During his courtesy visit to Lee Hae-chan, chairman of South Korea's ruling Democratic Party, he also said both countries have maintained their strategic communication channels on safeguarding peace and security on the Korean Peninsula. The ambassador reportedly delivered his government's wish for Moon to attend the Belt and Road Forum for International Cooperation slated for next April in China. He also expressed hope for South Korea-China summit talks to take place at the Group of 20 summit scheduled to be held in Japan in May next year, according to party officials. In response, Lee asked that Beijing completely remove the restrictions on group travel by Chinese tourists to South Korea that were imposed following the installation of a U.S. anti-missile defense system on South Korean soil last year, the officials said. Lee then said that the chances of an accidental clash or war between South and North Korea appear to have largely disappeared following three recent inter-Korean summits. Looking back on his recent visit to Pyongyang, Lee also said that North Korea's leadership seems to be asking South Korea to play an active role as arbitrator in the issue of the North's denuclearization.